When powerful business interests like the airlines lobby Congress and the FAA hard for a change in the law, you know they have something to gain. And someone stands to lose. 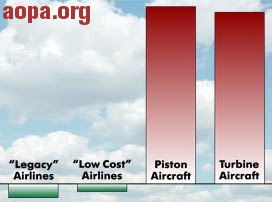 Recent FAA data make it clear; the losers are piston-engine aircraft owners, pilots, and business aviation. "It's no wonder the airlines love this proposal so much," said AOPA President Phil Boyer. "Not only would they pay less, they'd have more control over who uses the air traffic control system, and they'd have the majority vote in setting the fees they charge themselves and others." Under the Bush administration's FAA funding proposal, the "legacy airlines" (American, United, Delta, etc.) would see the amount they channel to the government drop by 27 percent. (Remember, under today's tax structure it is the passenger, not the airline, who actually pays that bill.) That would reduce their payment some $1.7 billion a year. The low-cost airlines, such as Southwest and JetBlue, would pay Uncle Sam about $286 million less per year — a 15-percent reduction. But piston-engine fliers as a group would see their taxes increase $100 million — that's 344 percent more by the FAA's calculations. It's nearly as bad for the kerosene burners. Turbine-powered GA aircraft would pay 333 percent more — an additional $868 million. But at least airline passengers will benefit, right? Don't count on it. Under the existing structure, airline passengers pay the ticket tax. The airline simply adds the tax amount to the charge and forwards the money to the U.S. Treasury. Under the new FAA funding proposal, the airlines would be charged user fees, not taxes. They wouldn't be a separate item on the passenger's ticket as it is today. The airline would get a bill from Uncle Sam, and they would calculate that charge into the cost of a ticket. "Do you really think the airlines are going to pass that cost savings on to the passenger?" asked Boyer.